Made by aluminium and coated with antique brass. 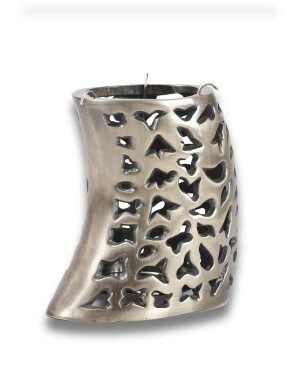 Size of Product: L-7.75"X W-5"X H-9"
Tea Light Holder is made of Aluminium which has Metal Antique finish. It is a beautiful piece with delicate carvings. It has a unique shape and if kept close to the wall, gives a nice shadow impression. Because of the Aluminium finish, it is easy to maintain and clean after every use.